WARNING: STAY AWAY FROM OUR WORKERS! CUSTOMER WARNING—FURNITURE MOVING IS DANGEROUS: Instruct your employees to stay a safe distance from the movers. Tell them not to touch, grab, push, pull or catch the furniture during the move. 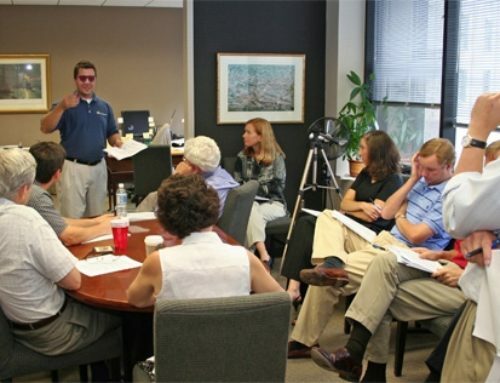 One Friday evening, a moving company was working in an office building in Fairfax, Virginia, for a Fortune 500 company. Included in the move were 60 fireproof file cabinets weighing around 800 pounds each. 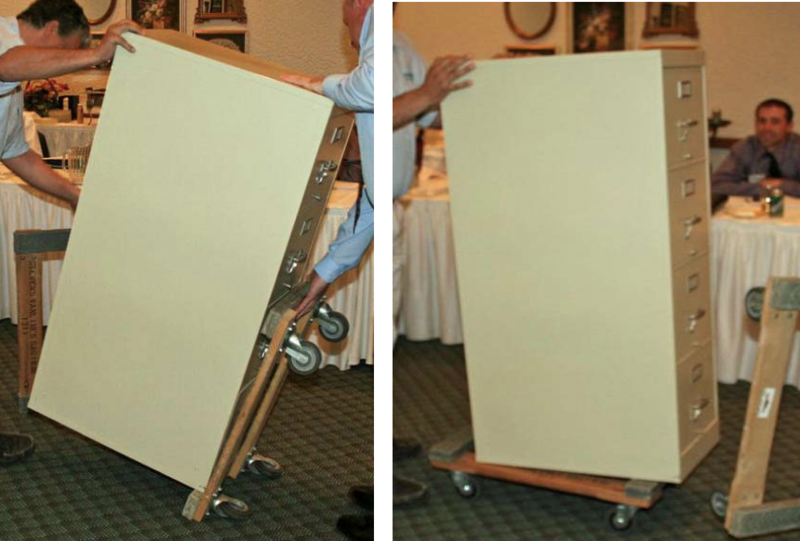 Three movers were using the “shotgun” or “Philadelphia method” of cantilevering a heavy cabinet onto a 4-wheel dolly with a second dolly. When they started placing the 22nd cabinet onto a dolly, the supervisor’s sweaty hands caused the cabinet to slip. The movers did what they should have done—they scattered—saving themselves from injury. However, at the same time, the customer contact, who was standing next to the cabinet, threw himself in harm’s way. Fearing the supervisor would be crushed by the weight of the cabinet, the contact tried to catch it as it fell. Unfortunately, it landed on his foot, flattening it like a pancake. You probably think this is the end of the story with the injured party collecting workers’ compensation for the rest of his life—but not in America! The injured victim sued the moving company for $7.5 million, alleging that the only reason the accident happened was because the moving company was negligent. The plaintiff said the shotgun method was not safe and should not have been used to move the cabinets. According to the plaintiff’s expert witnesses in the 3-day trial-by-jury, the movers should have used an appliance hand truck or tipped the cabinets onto their backs instead of using the shotgun method. At the end of the first day of the trial, the defendant’s insurance company offered to settle the case for $1 million. The plaintiff would still receive his employer’s workers’ comp insurance for all his medical bills and would get an additional $1 million tax-free for his pain and suffering. Apparently, he believed the insurance company would never have made the offer unless they thought they were going to lose the case, and he rejected the settlement. I was the only expert witness who testified for the defense, arguing that no matter which of the three ways you move fireproof file cabinets, there is a tremendous risk of injury. Before I tell you the verdict, I want to share the advice the defendant’s attorney, Geoffrey S. Gavett, of Gavett, Datt, & Barish, P.C., gave me at the end of the trial. He counseled that service providers should always verbally and in writing warn customers to stay away from the workers during a job. Think about it: If you’re a painter or a roofer, your ladder or scaffolding could fall and injure a customer; if you’re a grass cutter, your lawnmower could propel a stone and injure a customer; if you’re a carpet installer, the customer could trip over your tools or the carpet. And of course, if you’re a mover, furniture could fall onto the customer during transport. After three days of trial and after deliberating for only two hours, the jury found in favor of the defendant. Thus, the plaintiff received only his state’s limit of workers’ compensation. The best way to avoid litigation is to avoid the causes for it. There’s no such thing as an ironclad contract but by including a ‘stay away from our workers’ clause in every service contract, you’ll lessen your risk of being sued and let customers know you’re not taking any chances.